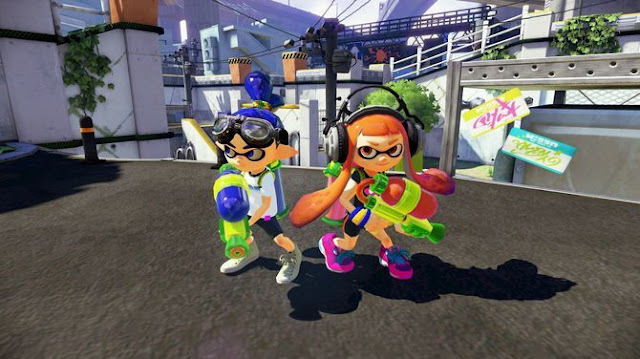 Welcome to our complete walkthrough to Splatoon for the Wii U. The game offers a colorful multiplayer mode also a campaign which is all about in this guide. The campaign consists of 27 levels and five boss battles. In each level you can also find a Sunken Scroll. In the first level make contact with the Octotrooper who wants to make you into the next mission life difficult. Many issues should pay with them but don’t have. Tricky are then already the enemy with a shield in front of the head. These have to distract with a bomb and then shoot. When you come to the area with the three major pillars, you will find the scroll at the left rear pillar. Splatter the column with color and swim as squid up. In the second level the overcoming many high walls stands on. Colored puffers ensure that lit the area in your color when you shoot. New in this level are the Octoballs. Try switch role and draw defender color behind him. They shoot you do not bring success. Wait until they are pure rolled into your color, then they are helpless and suffer damage. Watching also need in the ink killers. You eliminate your color once they are near. If you want high walls swim, you have to outsmart them by your left and right of your color. Otherwise, they are not dangerous. Once you have overcome the Ink killer the first wall, to your right (when you walk over the bridge) see a sign pointing down. Now look down - there is a hidden platform. As a squid you can go smoothly through the grid and the scroll out of the box. Octocopters are the new enemies in this level. They fly towards you, but are not particularly dangerous and done after a hit. As a squid you must jump over here greater depths and explore that bring you quickly from A to B. When you come to the area with the two tall columns, you will find the scroll on the right column. You must only high on the left column, then the right and jump shoot with color as squid over. The first boss is waiting! The Octostomp targeting up to you and wants to make you a flat belly flop. Differ from him in time and spray him with full of color. Then float up the dice and shoot from the tentacle. After two hits the Octostomp is significantly faster, which is why you should definitely might make to dodge a trace of color floating along it. If you defeat the Octostomp, you will receive a scroll and release the electric catfish. This level uses ink fountains to reach new areas and defeat enemies. As new enemies you will encounter Octostomp. Similar to the previous boss jumping at you and ask you from an evasive maneuver. In this level you spray sponge with color, so to soak them and progresses in level. But be careful: take the opposing color sponge, the sponge shrink again. This is in particular dangerous when you away from the sponge only lurks the free fall. This level uses propeller platforms to go up into the air. For this purpose, it fires your ink to the propeller. It becomes dangerous when you order chugs through the water and be shot at from all sides, because even if you're an octopus, water is not good for you. When you reach a propeller platform, situated in front of a glass wall, to your right. Imagine the platform and denied by the propeller. The platform goes up and you can jump through the hole. Here you will find a box with the scroll. In this level color large color brush in the field of opposing color. Instead of the counter, you can also run on these brushes just to get to the other side. it is trickier, if the brushes are not draped on the ground, but on the wall. If you see the brush that orbit a platform, go out into a brush on it and ride one round, it is worth. The first time you can find some orange upgrade balls and the second time a box of the scroll. For the first time you meet Octoling who has the same skills as you. From the numerous online games your skills should be trained so far that these disputes should not be a problem. Examine the arena at the rear on the left side. Hidden behind a column, a box of the scroll. Here it is time to dodge, because you will regularly surprised by an opponent Inkling. The inks bomber, who is responsible for turn off at the end of the level. After the third checkpoint you will find an ink fountain, which leads you to a lattice bridge. Popp down there as squid and destroyed the box – You will find the scroll. The next boss is no less simple than the first. Evade his shots and shoot yourself from the outstanding suction cup. You have to take all their floats to the top of Octonozzle and shoot from the tentacles. Repeat twice and the boss is defeated. Pick up the scroll, and release the electric catfish. In this level you use your ink for long jumps to sneak up behind enemies. When you come to the building where there are three "Inkrails" you must jump up to the second Inkrails" then you can cross to the other side of the platform. There you will find the scroll. In this level you have to deal with invisible platforms that you have to bombard with your ink to make them visible. So if you see no way of further bring you to simply shoot time around in the area. After the second checkpoint roll two Octoballs toward you. After you've completed their ramp run high and remain at the top of stand. Look down the side and shoot down to make a secret platform visible. Under the ramp the box with the scroll. Here you have to be careful as you have to go through the powerful warrior’s maze, which is guarded by Renegade Robots. Have they seen you, it could be over quickly if they encircle you. You must find the key in order to move forward. The first key can be found on the left side. Later, a Octo-recruit has nabbed the key. Look best on the gamepad to locate it. In the second labyrinth there at the end of a left and right platform, under the left is even one where you find the scroll. To get there, you take the right platform and take Inkrail. In this level it is important to overcome moving platforms. Make sure that you don’t push the grille off the platform and ye transformed in time into a squid. The scroll can be found after the second checkpoint, where a platform out of the building drives (with the two Octocopters). There you have the right to run around the building to find the box with the scroll. The Octoling has back apart on you and make you an ambush. Like last time you fight your way through the skatepark and perform the Octoling. The scroll can be found near the end of the level. Go where the last ink fountain is, the ramp right along and you will find the corresponding box with the scroll. As ever in the second region here again you take Ink bomber. Here the terrain is a little more freely and there are some dead ends, which makes things a little more difficult than the last time. The box with the scroll can be found behind the last checkpoint. To defeat the Octowhirl you have to shoot the ground with your color and hope that the Octowhirl sinks in when he comes hurtling at you. When the tentacle is sinking visible to you just need to shoot. After two more repetitions of the fight for you is decided. Pick up the scroll and the electric catfish and end the level. In this level it is important to shoot Proppeler platform to move out or it can be raised. Caution, you have to be quick, because the platform move back to its original position. The scroll can be found after the third checkpoint, if you targeted the cannon a distant propeller platform. If you look at the cannon to the left, you see a floating platform - there is the box with the scroll. Here you have to deal with Octosniper which shoot you in the long distance when you're under fire. Well only that hiding is placed sufficiently in this level. The scroll can be found after the second checkpoint, where a cargo net on the ground between the left and right path. Turn into a squid shape and slip through to find the box with the scroll. In this level you have to do again with string brush that leaves behind everything shine in the opponent's color. The scroll can be found after the first Checkpoint. Imagine the large two-sided applicator brush and jump from there to the platform on the right - there is the box with the scroll. Here you will find large rotating platform must overcome that. Make sure that you do not slip down while crossing. The scroll can be found after the last checkpoint if you have reached a grid bar and fall deep. Once at the bottom you turn around 180 degrees and see a collection with a box - it is the scroll. The Octoling is back and this time with algae on the head. This seems much more dangerous than the ones you had to do it before. The scroll can be found just before the end. Do not use the Zapfish at the end, but run on the ramp behind. Slip as squid through the grid and destroy the box with the scroll in it. Once again, you will encounter two ink bombers (Octobombers). Fight your way up to them and destroy them. When you come to the checkpoint, where left a sponge, you must use the right path and slip through the grid. At the end of the following long path you will find a box with the scroll. This boss is defeated relatively quickly. If he has targeted you, he forms a tooth-fence around you. Shoot you one way free and disappears quickly from the middle. After Octomaw from the ink shows up, you shoot the front teeth, until you see a tube - there you throw a bombe. Then the tentacle comes out. In the following round you target his teeth you do not have to shoot all the teeth, but only the front. After the battle, you grab the scroll and the electric catfish. In this level it is important to shoot switch then the path "form" you. So if you can not find a path, a switch must be somewhere. The scroll can be found after the second checkpoint. You should a "+" - see wall in front of you, where you have to swim up vertically to get the jump field. Float around it, because on the other side is a secret platform a box with the scroll. In this level you wander increased over sponge that her increased when she shoots with your color. The difficulty is the opponent to do fast enough, so they do not take the sponge and may carry you into the abyss. Here you will find rotating platform that you can slide from the stage - by the grid platform you can slip through as squid. Once again, you must pass through its maze. Look at the launch pad, to find out where the needed keys are hidden. The scroll will you when you walk in the third jump field at the edge of the platform and jump off - there is a secret platform with a jump box that leads you to an area where you will find the box with the scroll in the middle. One last time you will face the Octoling on the way! The scroll can be found on a platform that is similar to the starting position, it is only on the left side. A final ink’s bomber must be defeated. Along the way, you have some Octosniper targeted. To advance to the Ink Bomber you need also a key that can be found on the top of the arena in the middle. What is to do? First of all, you should avoid waiting until the boss extends the huge fist rockets. The fists shoots from her and knocking them back, so that the boss must recede. After a few hits he fires a huge rocket, flinging her to Pong-style back and forth. Until it pops. The need to repeat it several times, and it becomes more difficult and you have less space or the new boss enemy will send to the field. For once you have the scroll to pick up during the fight. The box is located after the first checkpoint after you've passed the second Proppeler platform.